CHARLOTTE (October 11, 2016) – CARSTAR Auto Body Repair Experts’ proprietary EDGE program continues to grow as the industry’s most innovative advanced training and education program for collision repair shop owners and managers. 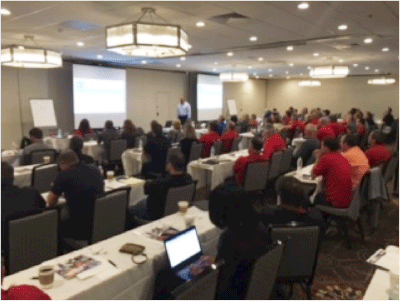 At the latest CARSTAR EDGE Performance Group meeting, held last week in St. Louis, CARSTAR had 132 stores participating, its largest event to date. The program, now in its third year, has helped many of its stores achieve the industry’s highest KPIs, a measure of performance and operational efficiency, and industry leading customer satisfaction. For 2016, the CARSTAR Operations team has expanded its EDGE Performance Group platform, with the goal of continuing to raise the bar in the CARSTAR 3C initiative, which is Closing Ratio, Cycle Time and CSI/NPS scoring. Many CARSTAR locations repeatedly have a Net Promoter Score (NPS) exceeding 90 percent - a full 10 points higher than the industry average of 79 percent. CARSTAR is not only working to uphold those high numbers, but they are also focusing on another important benchmark, length of rental as measured by insurance companies. With the understanding that insurance companies are seeking to drive down car rental cost and drive up customer satisfaction, another goal of the EDGE Performance Group is to help stores to reduce their length of rental. "From my perspective, the CARSTAR EDGE Performance Groups are the most powerful tool that CARSTAR has,” said Kerry Woodson, general manager for CARSTAR Jungerman. “By educating owners like myself on how to run our businesses more profitably and collaborating with other store owners we have grown from a store struggling to do $1 million in sales to this year doing more than $3 million in sales. This would not have been possible without the help of my fellow franchisees and CARSTAR’s corporate team with assistance on how to market my store, educate my staff and understand my profit and loss statement. They are always there for support whenever a question arises." The expansion of the EDGE Performance Group program includes more substantial content in each Tier of the program, the addition of OPGs, or Operational Performance Groups that are held regionally to support GM training and MPGs, or Market Performance Groups. Many CARSTAR shop owners are participating in EDGE Performance Groups this year, and they are finding that the program is working for them and enhancing their operational standards. The most recent event was held in St. Louis, and the participants visited CARSTAR Jungerman, CARSTAR Kurt’s, CARSTAR Gapsch and CARSTAR Arnold. “CARSTAR EDGE Performance Group meetings are where I get the most value from being a CARSTAR franchisee,” said Heath Harris, owner of CARSTAR Arnold in Arnold, MO. “The information and analysis helps me manage my business more efficiently. Knowing the true performance of my store keeps me ahead of industry trends and my competition." CARSTAR hosts EDGE Performance Groups several times per year in strategic areas throughout the country. The EDGE Performance Group participants review business analysis and management practices.